Tzitzit (tseet-tseet or TSIT-sis) are the strings, or fringes, tied to each of the four corners of a tallit, or prayer shawl. They are widely considered a reminder, not unlike a string around one’s finger, to think of God at all times. Speak to the Israelite people and instruct them to make for themselves fringes on the corners of their garments throughout the ages; let them attach a cord of blue to the fringe at each corner. That shall be your fringe; look at it and recall all the commandments of the LORD and observe them, so that you do not follow your heart and eyes in your lustful urge. Thus you shall be reminded to observe all My commandments and to be holy to your God. The commandment to wear tzitzit is repeated in the V’ahavta section of the Shema prayer. While traditional Jewish law says one must have these tzitzit on every four-cornered garment one wears, today most clothing doesn’t have corners. 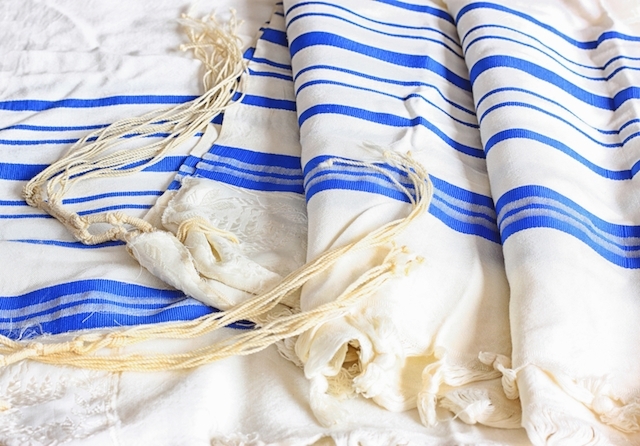 Instead, the tzitzit are on the prayer shawl and on a special small tallit, called a tallit katan, that some traditional Jews wear under their clothes. Some traditional Jews let the tzitzit from their tallit katan hang out, while others tuck them in. The tzitzit are attached to the corners and knotted according to a specific pattern. For an explanation of the pattern and its significance, click here. To learn how to tie tzitzit, click here. Why do some people tuck them in, and others let them hang free?